Game 4 was an embarrassment for Toronto Raptors fans and a wasted opportunity to put the Indiana Pacers under and stop them in their tracks. Instead they returned home with series tied and back to square one. So the Toronto Raptors will try to get over the wreckage of their Game 4 disaster of a performance, and try to overcome their two biggest offensive stars being M.I.A. There will be lots of questions about if the shooting of DeMar DeRozan and Kyle Lowry will be enough to get out of the first round of the playoffs and if they are really stars. Since real super stars know how to work their magic in the post-season. Media has speculated that their coaching staff need to find ways to get the stars space for open shots. Coach Dwane Casey suggested that on Saturday night after the debaucle. But many think it’s an issue of Lowry and DeRozan needing to actually make their shots count. The rest of the team is doing them no favours either by failing to hit open shots when Lowry and DeRozan are too well covered. Unloading the ball to someone who is unguarded but not equipped to make clutch shots also needs to stop. When you look at the shooting statistics for this series the Raptors have been unable to convert clean looks into points. 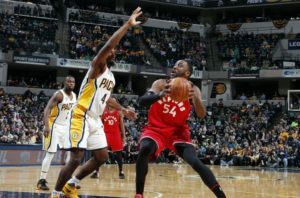 Game 1 jitters should have long passed, and those misses can’t be accredited to the tough defence of the Indiana Pacers, since Toronto has overcome a lot of defensive challenges over the course of a 56-win regular season. They know how to make shots. And that’s going to be Casey’s biggest problem heading toward Game 5: when players have stopped doing something that they used to do with ease, how to get them to start doing it again? 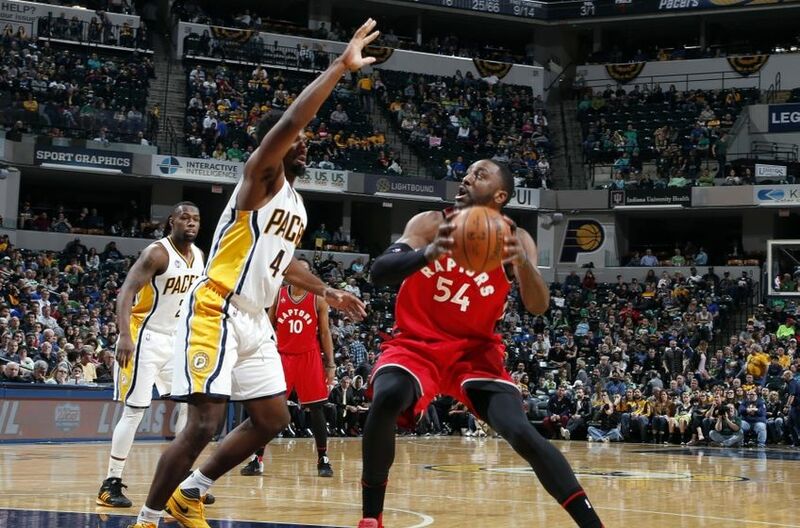 Through four games against the Pacers, the Raptors have made 44 percent of ‘open shots’. That’s close to their regular-season average of 42 per cent. But on shots that are considered ‘wide open’ where the closest defender is more than six feet away, the Raptors are only 11 for 39 in the playoffs, or 28.2 percent. In the regular season, they were 46 percent on wide-open shots. So what has happened? Have the Raps just forgotten how to play ball? Game 4 was a tire fire for Toronto right from the start, but they did have chances to shoot their way back into the game, but they kept missing clear and open looks if not totally air-balling them. The numbers are clear: Toronto is 7 for 28 (25 percent) on wide-open three-point attempts in the playoffs. Many blamed Luis Scola in Game 4 alone for those miss but his were only blatant ones, in truth he was only responsible for a handful of them. The Raps shot 42 per cent on wide-open threes in the regular season so that has got to change, and change fast. Strangely enough, Kyle Lowry was ‘confident’ after the Pacers took down the Raptors in Game 4. When you look at his stats, the trend is even more alarming. He took 57 percent of his shots in the regular season under very tight defence, but in the playoffs he’s only taken 38 percent of his shots in those situations. Imagine that 48 percent of his playoff shots, almost half have been considered ‘open’ and he’s converted only 32 percent of them! That’s not how a star had to play. Alongside that, he’s also only hit 37 percent of his wide open shots, after shooting 52 per cent on those in the regular season. Lowry has missed badly from the three-point range, where he is 5 for 27, or 18 percent, in the playoffs, after being a 39 percent shooter from distance during the regular season. And of Lowry’s three-point attempts against Indiana, almost three-quarters of them have been either open or wide open. And he’s shooting only 25 percent on those. Basically, if Toronto wants to win, their stars have to be stars, because so far they have not lived up to their hype or potential. And this lack of power harkens back to the last few seasons where they couldn’t make it out of the first round of the playpffs despite having stellar regular seasons. Casey, has tried to take the heat for his All-Stars when he told media post game “it’s on me to get them better looks.” He spoke about screens and movement and techniques to help Lowry and DeRozan find space. It was good coach talk but can it translate to the court? Tomorrow night the whole city of Toronto will see. But there is only so much the coaching staff can do and the numbers don’t lie though tell only part of the story. Bottomline: Lowry and DeRozan are getting good looks but they are missing them. And the contested shots that they used to hit aren’t going in, either. And it’s cost them big time. Yes, the Pacers can play some good defence, but the Raps’ supporting cast off the bench need to bury more uncontested shots that will take the pressure off the defence for their backcourt. But the most important thing is clear: Lowry and DeRozan need to convert on their opportunities, like they did over the 82 games played in the regular season. But that’s why the playoffs are the playoffs and it’s almost like a second season. And in the playoffs, a team needs their best players to be the best players. If the can’t do that, then at least they can’t be the worst. So everyone will be watching for this duo to raise their game. We think they can do it.